Over the last couple of years I've taken a look at quite a number of laptop stands but if I recall correctly, all of these were mainly designed for cooling your laptop. That's not the case with the Logitech Comfort Lapdesk for Notebooks - as the name of this product suggests, this lapdesk is designed to improve your comfort. If you've ever used a notebook on your lap while sitting on the couch or in bed, you probably know this can be a rather unpleasant experience because notebooks generate quite a lot of heat. I frequently work on my laptop while sitting on the couch and if I don't use a surface under my notebook my legs become uncomfortably hot after about 30-45 minutes. Besides excessive heat, many laptop users also experience other problems such as neck pain. This is were a product like the Comfort Lapdesk from Logitech comes in handy. 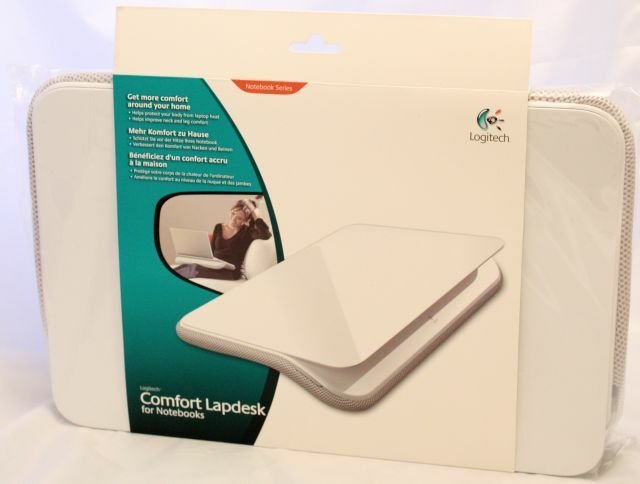 Here's a look at the retail package of the Logitech Comfort Lapdesk, it's pretty basic. The product can be used with PC and Mac notebooks with a display of up to 17". 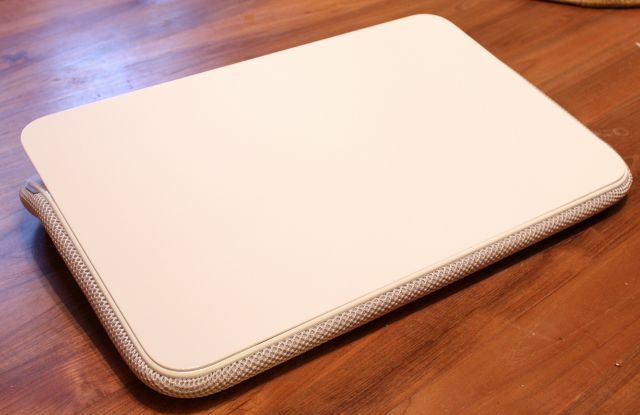 The top of the Comfort Lapdesk is made out of hard plastic with a shiny white color. I don't have a Mac but I think an Apple laptop will look very good on this laptop stand. The white surface is glossy but unfortunately it's a dust magnet, dust is easily spotted on this surface so you'll need to clean it every once in a while if you want to keep it tidy. 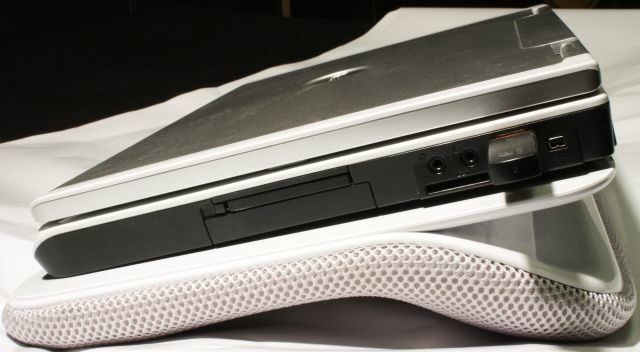 Four-layer heat-shielding design: Protect your body from unwanted heat from your notebook so you can work or play comfortably with your notebook on your lap. Twelve-degree angled riser: Position your notebook to a viewing angle that's more comfortable for your neck and legs (when used in a seated position). Stable, lightweight design: Use your notebook comfortably just about anywhere—on your sofa, bed, or even the floor. Soft, air-mesh fabric: The underside of the Comfort Lapdesk feels great on your legs. Thin, streamlined profile: This compact solution will look good in any room in your home and can be stored neatly near your bed or couch. To improve comfort, the Comfort Lapdesk features a twelve-degree angled riser to elevate the display of your notebook to a more comfortable viewing height. This feature should help to prevent neck complaints. 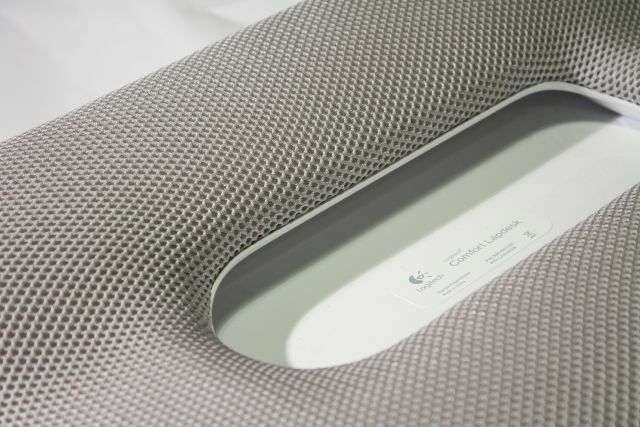 The bottom of the Logitech Comfort Lapdesk is one big soft, air-mesh fabric made out of polyester and polyurethane. It feels a bit harder than I expected but this cushion definitely feels better on your legs than the plastic of a laptop. 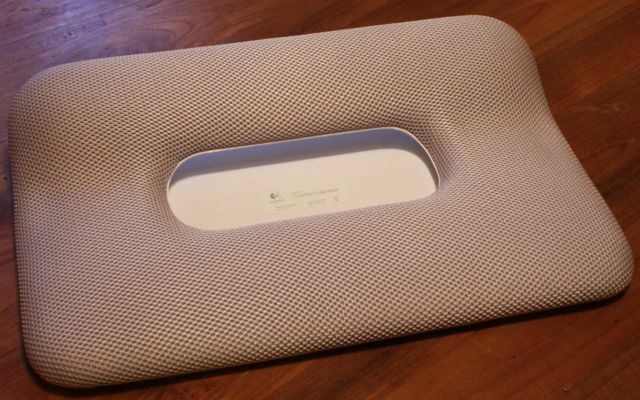 Logitech says the Comfort Lapdesk features a four-layer, heat-shielding design. The hard plastic top layer, the bottom-layer's fabric and the air-flow chamber between the product's base and top all help to minimize heat. Additionally, the arched base of the Comfort Lapdesk makes contact with your legs in fewer places than a notebook, improving air flow. Below is a photo of my 15" Dell Inspiron 6000 on the Logitech Comfort Lapdesk, there's enough room for a 17" notebook and I think it's big enough to fit some 18.4" models as well. The plastic surface measures roughly 440mm x 280mm. There's not enough room for your mouse, but even if there were it wouldn't be of much use. 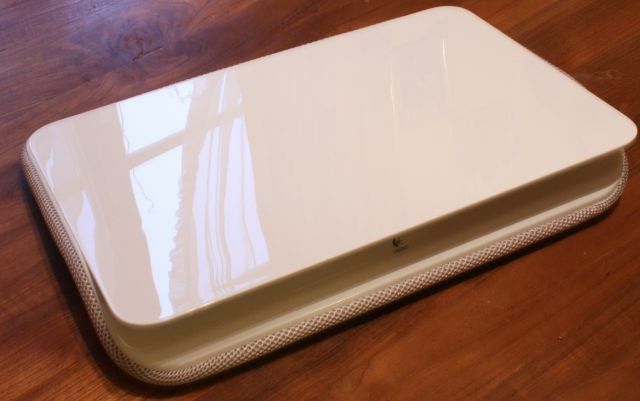 I tried the Logitech V220 on the lapdesk but the shiny white surface didn't provide any tracking at all. One of the first things I noticed is that the Comfort Lapdesk lacks a ledge on the front to prevent your notebook from falling off but while using the product I found that this wasn't really an issue. If you use the lapdesk properly the rubber feet of your laptop will stick sufficiently to the shiny white surface. I've been using the Logitech Comfort Lapdesk for a bit more than two weeks now and I've grown very fond of it. The lapdesk has a stylish design and provides a comfortable, stable base for your laptop. 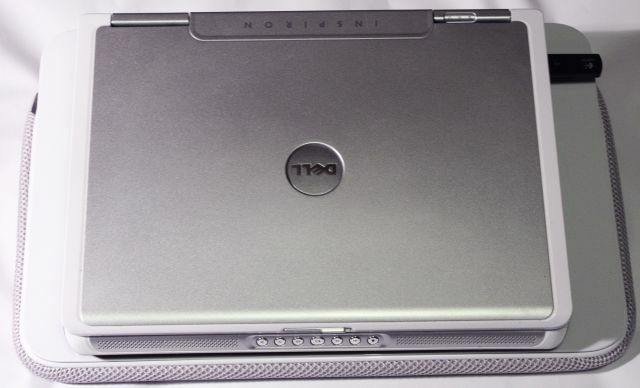 It improves the ergonomics and does a really good job at shielding you from all the heat that your notebook emits. The Logitech Comfort Lapdesk has a MSRP of $39.99, if you don't mind the relatively high price I definitely recommend it. 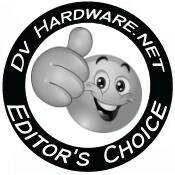 I give the Logitech Comfort Lapdesk a 9/10 and our Editor's Choice award. It is nice and light weight, and a nice design too. Could almost be an Apple product, under my MacBook Pro. This is just too incredible, but true anyway. The designers of this product managed to choose for the sloping surface a super smooth plastic. So my MacBook just slides off (almost hit the ground). They add to the package four ugly rubbers, that stick out like pimpels. They become dirty and it is humany impossible to place them in a estheticaly nice way on the surface. So the whole Apple feel is completely gone from the looking at the Logitec product. To me it is beyond comprehension someone would design such a flaw into a system. Why not make the surface so that stuff you are supposed to place on it won't slide off? I like the Laptop Flip as a stand for my Macbook. It raises my laptop and stores it in the vertical position when not in use saving me desktop space. Once of the nicest laptop stands I've ever seen. The bottom looks a lot more comfortable than the hard plastic, metal or wood you usually find on other stands.